Spent a fair amount of time making this in After Effects. It's for the ending credits of My Pet Rock. At first I planned on drawing the waves frame-by-frame in Flash, but then I realised how much more complicated it would be to do it that way, and time consuming. So I decided to create it in After Effects using a few different effects. I used a fractal noise with vector blur applied to create the water 'refraction' effect, and a CC film burn effect to dissipate the wave when it is receding. The whole animation is about 7 seconds but is easily looped. I looked at different beach videos and photos for reference, overall pretty pleased with the outcome. 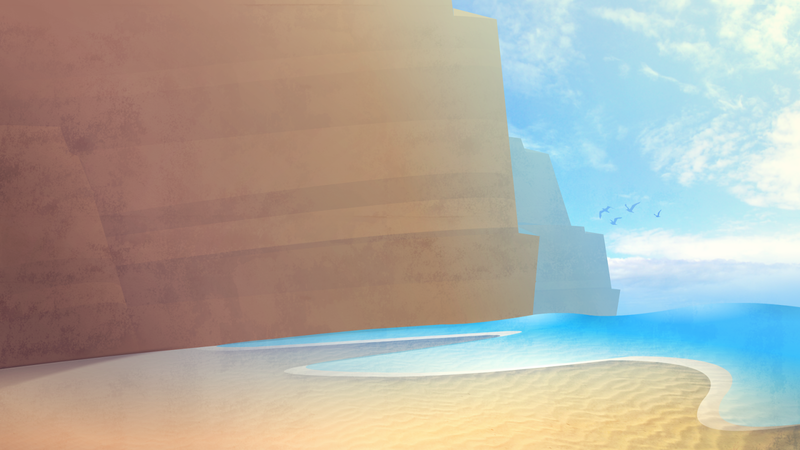 This is just a re-do of one of the first beach backgrounds in the Film; it was changed for perspective reasons, to fit the low camera angle it is meant to be. Just brought the cliffs forward and adjusted the horizontal stripes accordingly.